When a CCTV system is sold, service tends to be the last thing to be negotiated, an after thought almost. What however should a customer expect in terms of cover? Well most will get the first 12months free manufacturers warranty with the installation. Almost without exclusion manufacturers will back their products from anywhere from 12 months to 5 years and its it worth asking this as a customer at the point of sale. If you know how long the manufacturer backs his kit then you can a) be confident you are buying well and b) ensure you benefit from the warranty in the event that the product fails. During the first 12 months you will need to cover yourself in the event of a failure. Just because the manufacturer will replace your goods does not mean the installer is obliged to supply their labour in order to change over this faulty part. The solution is to go for a fully comprehensive agreement this will cover all call out and labour meaning you wont get any nasty bills. One word of caution though, A service agreement will not cover accidental damage or vandalism, electrical surges also tend to be excluded. So you must also insure your camera system as well. On the anniversary of the install the installer will usually offer you two options. A continuation of the fully comp deal or a preventative agreement. Preventative agreements normally will mean 2 visits per year to clean and test the system throughout, all other calls to the system and parts replacement will be chargeable. It is therefore important to know what the maintaining company charges per hour and there may be call out and travel charges to think of to. Finally when you buy your CCTV system you must ensure you buy a brand of cameras that can be looked after by the mainstream of security companies. Many times consumers have been caught out buying closed protocol equipment with protected software and passwords that only the current installer has access to. When you are buying they may sell this to you cheaply knowing that year on year they will be the only ones who can maintain your CCTV. Be assured your service costs and equipment replacement prices will be astronomical but sadly with no other way to maintain your cameras you will be left with a choice of stick with the camera equipment you have bought or rip the lot out and start again. Don’t get caught out with this one. So are you better off without a CCTV service agreement at all and just pay as you go? Probably 5 years ago yes, this is because the big brands like Samsung, Pelco and Panasonic ruled the market and their products were second to none. They were in fact so reliable the failure rate was negligible. However over the 5 years things have changed. The recession has encouraged end users to buy cheaply. This unfortunately has meant despite warranties on the goods themselves, rarely will a £60 camera actually last much longer than 2-3 years, it really is a case of buy cheap buy twice , oh and also you will spend a fortune on service calls along the way. Short sited buyers and those out to install cheap equipment in order to undermine the real installers have destroyed confidence the industry. Yes as the recovery comes round these failing cameras will give way to HD CCTV solutions that will revolutionise the industry in the long term, so plenty of optimism for the future. 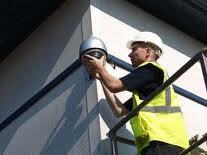 However the question was are CCTV service contracts value for money? Well all said and done, yes. Ensure however you get the right guys to do the job. There are lots of unqualified installers, full of good intentions that may unfortunately let you down. The clever consumer will pay a little more for a better service and at the end of the day a CCTV system that works when you really need it. This entry was posted on Monday, September 24th, 2012 at 20:46	and is filed under CCTV. You can follow any responses to this entry through the RSS 2.0 feed. Both comments and pings are currently closed.